Makita cordless screw guns are a good choice for both professionals and Do-It-Yourselfers. Makita offers a large number of cordless screw guns which are known for their increased productivity and versatility. Let us now take a look at their important features, upsides and downsides, and what people who use these products have to say about them. You can find different types of Makita cordless screw guns on the market today. Listed below are the features available in some of the most popular models of screw guns from Makita. 	Two speed design for a wide range of drilling and driving applications. 	Ergonomically design which offers superior control and comfort. 	Neatly designed handle which is easy to grip. 	Powerful high performance motor which delivers the needed torque for drilling and driving applications. 	Keyless chuck which makes bit removal and installation a very simple process. 	A unique Shift Lock Drive system which helps shift from the drill mode to the drive mode very quickly. It also locks out the clutch for superior drilling performance. 	Variable speed trigger for superior control. 	3 mode settings for driving, drilling, and hammer drilling applications. 	A forward/reverse button which is easy to access and easy to operate. 	Inbuilt L.E.D light which illuminates your entire working area. 	Powerful, long lasting batteries and an optimum charging system. 	Lightweight, compact design to reduce operator fatigue. One thing which separates Makita from most other power tool manufacturers is the number of choices available. Whether you are a professional or a Do-It-Yourselfer, you can easily choose a screw gun according to your needs and expectations. From 12V auto-feed screw guns to 18V auto-feed screw guns, Makita has a wide range of models on offer. Let me now tell you a little more about Makita cordless screw guns and their upsides and downsides. One of the most important aspects of these screw guns, according to a number of reviews, is that they can be used as a hammer drill, standard variable speed drill, or a screw gun  depending on your needs. In hammer drill mode and speed drill mode, the maximum amount of torque is delivered to the head, making it easier for you to drill things. In screw gun mode, there are 16 different types of torque settings available. You can choose the right setting depending on the amount of torque that should be delivered to the head. So, Makita screw guns are very useful for a wide range of applications. Some of the models come with an impact driver which helps you drive long screws into hardwood or any other types of materials. The L.E.D is really bright and illuminates the work area quite nicely. An important thing that a lot of reviewers have mentioned about Makita cordless screw guns is the optimum battery charger which accompanies the Lithium-Ion batteries. It only takes about 20  40 minutes to recharge the batteries completely which is impressive to say the least. The battery life is also quite good. It should be noted that some models of Makita screw guns come with Ni-MH batteries or Ni-Cad batteries. While both these types of batteries are good, Lithium-Ion batteries certainly tend to last longer. This is something that a lot of reviewers have mentioned in their reviews. Some people feel that the case that comes with certain models is not that good since it is too soft to protect the screw gun from any damage. Makita cordless screw guns are available in a number of different models with a wide range of features. Depending on your needs and your budget, you can pick one that is best suited for your work. 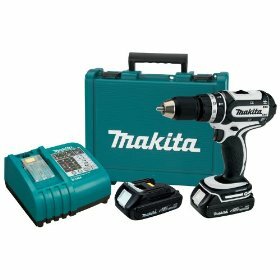 Return From Makita cordless screw guns Page to Home - Finishcarpentryhelp.com.